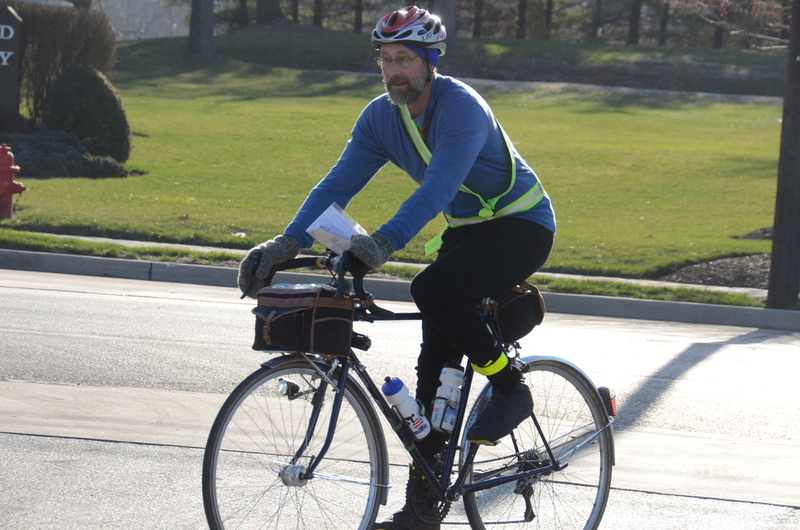 When I saw Mark B.’s Velo Orange Randonneur making an appearance on rides this year, I knew it had to be part of Bikes to Like. His bike is so lucky. 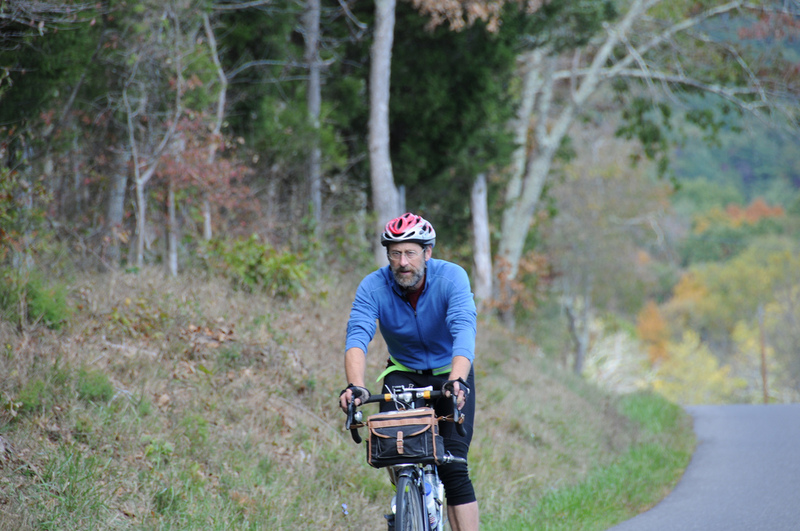 It gets to traverse the stunningly beautiful terrain of the Shenandoah Valley, which Mark calls home. Here is what Mark had to say about his lovely steed and the riding he does on it. I ride a Velo Orange Rando frame built up from miscelleneous parts from an early 90’s Cannondale and a newer Bianchi. It’s all steel. My wife and I also share a Burley Rhumba tandem that is a hoot to ride. As you know tandem riding is great fun, though Rhonda says she doesn’t think our marriage would survive a 300K. Apparently, I get crabby toward the end of a 200k brevet. The majority of my riding is commuting to and from work three to five times a week. I have several routes that keep me off main roads and are very scenic. I live outside Middletown, Virginia, and ride to work in Winchester over lightly traveled rural roads. The longest route is 34 miles round trip; the other is 22. About half the distance of the longer route is on dirt roads and passes old farms and apple orchards. The car people stay off these so I can travel the first eleven miles or so without traffic. One route takes me over a ridge line with views from Snickers Gap to the northeast to Signal Knob in the south. But once in Winchester traffic picks up and I use a very narrow bike lane into the historic district where I work. I’m doing my best to reduce my participation in the suburban sprawl that is eating up our local orchards and farms. Oh, did I mention oil dependency and global warming? 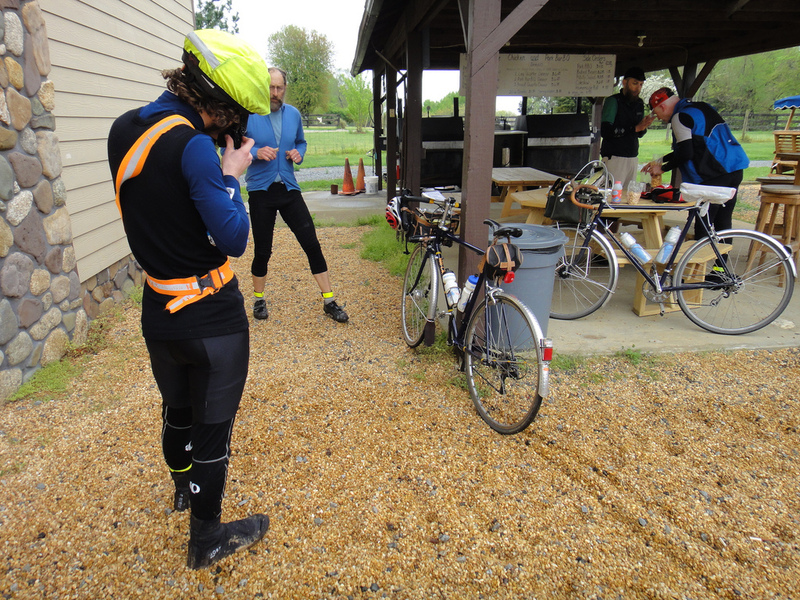 Otherwise, I ride the occasional brevet with the D.C. Randonneurs or Randonneurs of the Mid-Atlantic. I’m not keen on driving long distances to rides, so I rarely travel more than a half an hour away. If there is a brevet starting nearby (Middletown, Matt’s house), I have few excuses for missing it. But, as MG knows, I do drive to local brevets– sheer laziness. Skyline Drive is 25 minutes away by car, so I can easily get in a mid-week ride in the evening. There is usually less traffic and the evening sun lighting up the Shenandoah River in the valley below is mesmerizing. I can get in a bit of birding too as I climb the 10 miles to Compton Gap. 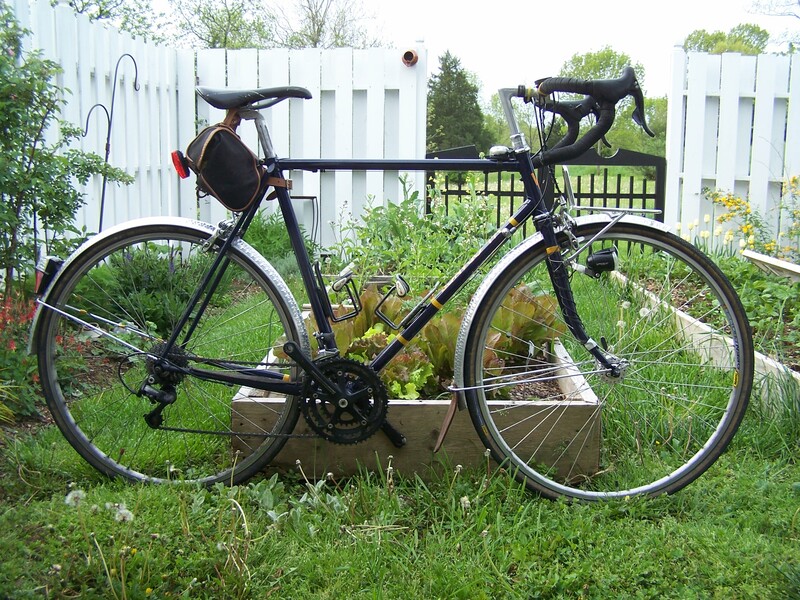 When we roll out the tandem, we can hit familiar brevet terrain around Oranda and Middletown, Virginia. The Shenandoah 1200 route passes down the road from our house so we ride a bit of that route. This is great place to ride. Lugged frame. Steel. Horizontal top tube. Low trail. Subdued graphics. It has an unmistakeable classic look. I was riding in Montana last summer and fell in with a club ride. They were all guys tricked out in advertising wear and carbon fiber componentry. I was on the VO. One guy looks at my bike and says “you must have a lot of miles on that thing.” Well, I’d bought it previous Fall and had only a few thousand miles on it, but it fooled the youngsters. I imagine it will still be on the road long after the carbon cracks. 4. If you could describe your bike in one word, what would it be? A bike without fenders is a mere toy. All my bikes have had fenders. And lights. The VO has hammered aluminun fenders from Velo Orange. I thought they would sort of pimp out my bike because they are so shiny metallic, but I have come to like them. Mark’s Velo Orange Randonneur (c) Mark B.
Oh yeah. I named it Hirundo, which is the genus name for a species of bird. Years ago I used to ride in the Clifton, Virginia, area before it was destroyed by development. Had to have been in the middle 70’s, back when the area was mostly forests and farms. I used to ride out to Hemlock Regional Park and spend the day birding and on one particular occasion I was shadowed by several Barn Swallows for a few hilly miles. I was struck by their grace and agility, in contrast with my efforts, but when they flew close in they looked like they were really working hard. I thought I could see their flight muscles cranking away to achieve those effortless-seeming moves. They were more like athletes than flying jewels. Years later when I saw the color of the graphics and frame of the VO, I was immediately reminded of those Barn Swallows Hirundo rustica. But I don’t call my bike by that name. I just call it My Bike. The Son generator hub, which powers both head and tail light. No more recharging batteries. No more failed batteries. No uncertainty about batteries. My lights are on all the time; why not, I’m off the grid. My VDO wired MC1.0 bike computer with altimeter. I had the wireless version for a time, but the sensor batteries kept crapping out when I really needed it so I switched to the “old fashioned ” kind. The altimeter feature is really wonderful because it shows why I have suddenly lost speed–I’m on a 1% grade; of course I can’t ride as fast! We do a lot of climbing out here and it is fun to know that such-and-such climb is 15% or whatever. The max on our favorite route is 15%, but at least its gravel. Am I going to keep this bike? VO is making noises about a new 650B in a great color with a real nice curve to the front fork. Sadly it won’t be lugged. With the type of mixed surface rides I do and the limitations to tire size on the Rando frame, I just might have to make the leap. The 650 would take over all the functions of my bike so the components would have to shift over and this frame will be up for sale. Wow, after reading about all the areas you can ride during the week, I have to say I’m a little jealous. Thanks, Mark, for being part of Bikes to Like, and I look forward to riding out your way soon.